Today the sleep apnea treatment we’re going to cover is dental devices. To explain how dental devices work, I’m going to tell you the story of John Washington. John suffered from sleep apnea for years until a dental device cured his apnea. Now he’s been CPAP-free for 5 years! Read on to learn how you can follow in John’s footsteps. John Washington became aware of his snoring at an early age. Family members and his nearby neighbors were certainly aware before he was – his snoring was so loud that his parents finished a portion of the basement as a bedroom for him! As John aged, the symptoms continued. It was hard to get up and by afternoon, he would “hit a wall”, and need to take a nap. He also was also involved in some car accidents as a result of falling asleep at the wheel. To compensate for fatigue, John would take No-Doze(TM) or other stimulants to stay awake. He frequently took naps at odd times when possible. John used to work in the Navy, and would frequently be out at sea. His snoring would keep his shipmates up, and soon word of his snoring problem reached his superiors. John’s Chief Petty officer ordered him to see a doctor next time at port. John’s doctor advised him to look into a dental device, and referred him to a dentist. The dentist made a mold of his teeth. What John ended up with was a dental device called a “mandibular advancement device”. Within a short time John experienced refreshing sleep and his daytime fatigue disappeared. He’s now been without sleep apnea for five years! John’s only regret is not addressing his problem years earlier – especially because those automobile accidents could have been avoided! 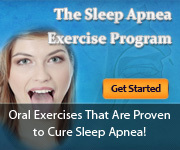 He advises anyone with sleep apnea to educate themselves on every option available to treat their apnea. The dentist will examine your general oral health and may make other suggestions regarding your teeth. If you would like to learn more about John’s experience with his dental device (including his advice to other sleep apnea sufferers) I urge you to go to this webpage.